TV company ABC filmed a programme called 'Sing along with Joe' featuring Joe 'Mr Piano' Henderson. 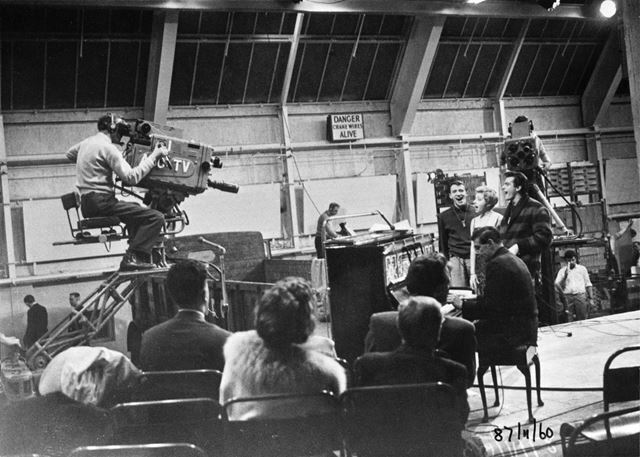 The programme was recorded in the works canteen at Ferodo and included a heat of 'Miss Industry'. The Ferodo brake lining company (now Federal Mogul) was founded in 1897 by Herbert Frood, who developed a revolutionary new braking material in his garden shed at Combs, within the parish of Chapel. He pioneered the manufacture of woven cotton brakes for horse-drawn carts then developed more hard-wearing and heavier duty brakes for motor vehicles.